As CA grape growers survive powdery mildew “season,” there is another hurdle that emerges – Botrytis. 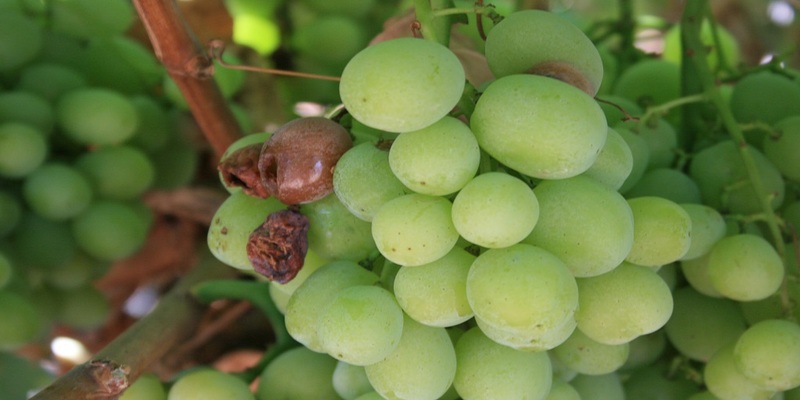 Botrytis is a late-season disease that feeds on sugar and affects ripened grapes. Fruit is most at risk when there is excessive humidity and moisture on the surface of the fruit and when temperatures are between 58⁰ and 82⁰ F. Grapes that have been damaged by insects or birds also provide openings for infection. What makes Botrytis so dangerous for growers is that once it is spotted in vineyards, it’s already a problem. Therefore, it is vital growers are proactive with their management program instead of reactive after the disease has created symptoms. In California, we’re testing a new product for efficacy against key grape diseases. In these trials, Miravis® Prime fungicide has shown good control of Botrytis. As seen in the video below, grapes treated with Miravis Prime show less diseased fruit compared to a competitor product, leading to better marketability. ©2018 Syngenta. Miravis Prime is not currently registered for sale or use in the state of California and is not being offered for sale.